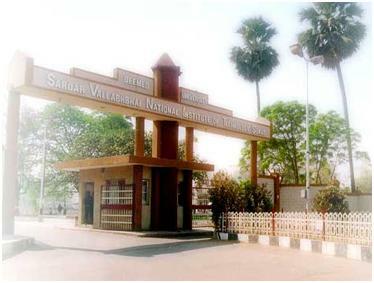 Named after India's first Home Minister Sardar Vallabhbhai Patel, the Sardar Vallabhbhai National Institute of Technology, Surat is one of the 17 Regional Engineering Colleges that were established as joint venture by the Government of India and the Government of Gujarat. Established in June 1961 with Bachelor's Degree Programmes in Civil, Electrical and Mechanical Engineering on the curriculum, the name of the institute has been changed to National Institute of Technology in recent years. The institute has on offer seven undergraduate courses of Bachelor of Technology in disciplines like Electrical, Mechanical, Civil, Chemical, Computers, Electronics, and Production Engineering. Also on offer are postgraduate courses in Structural engineering, Environmental engineering, Turbo machines, Water-resources engineering, Mechanical, Electronics and Chemical Engineering. The undergraduate course admittance undergoes the competitive AIEEE exams, while the admittance for post-graduate programs requires going through the GATE exams. The college campus covers an area of over 1 km² (250 acre) on the Surat-Dumas Highway, in the city of Surat, Gujarat in the area known as Ichchhanath, about 10 km from the Surat Railway Station. The Institute has a well equipped library, a computer centre, and lecture hall complex, various laboratories in different departments, Association of Computer Machinery (ACM), SAE, Student Council, workshops, health care centre, and adequate facilities for sports, games and co-curricular activities, Physical Education and Sports, Health Facility ,  Library & Cultural Society, Hostels(9)Technical Society, Banking and Postal Facility , Student activity center etc and also including in all eleven hostels facilities. The college also has a well-established Central Learning resource centers like Central library, Central Computer Centre, Entrepreneurship Development Cell, Continuing Education Centre and Physical Education Section. The college also has an active Training & Placement section. The college has three Post Graduate Centers too one for each Civil Engineering, Mechanical Engineering Departments, and Applied Mechanics. The college also has a Canteen, a Students Store, a Dispensary, a Guest House, a Post Office, a branch of the State Bank of India and play ground for some of the major games, viz. Football, Basketball, Volleyball and Cricket. The college in all has seven hostels, six for boys & one for girls, accommodating about 990 students. About 191 units of staff quarters for different categories have been built on the campus. Entru-meet is SVNIT Surat's annual Entrepreneurial festival. It is a platform meant to collect, test and enhance the entrepreneurial skillfulness of the youth of the country. Then there is Sparsh is the SVNIT Surat's annual cultural festival which usually commence in the second week of March every year. This 5-day festival is an extravaganza of literary and debating events and competitions and cultural shows. Mindbend is the SVNIT Surat's annual technical festival with technical competitions and events covering all areas of engineering, with competitions, guest lectures, workshops and quizzes comprising the main events. The best institutes in the world have strong alumni support to nurture raw talent and encourage the spirit of entrepreneurship and successful start-ups in the institute. Keeping the same spirit intake is what the institute has planned for the alumni.